Another down week on all three indicators, led again by an 8 point drop in the Solo Blog Index. Pulling the SBI down were declines at Vetivresse, JaimeleParfum and MaisQuePerfume. The five top-rated solo blogs (Alexa rankings above 1,000,000) sank, with the exception of NathanBranch which rose 2%. Four of the five sites on the Team Blog Index declined this week, but the gain by ISmellThereforeIam held the TBI drop to a single point. 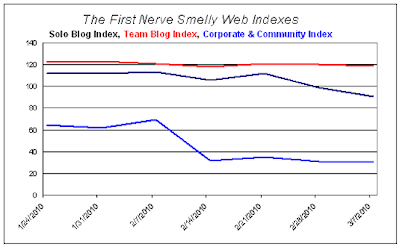 The Corporate & Community Site Index hit a record low for the second straight week with a startling 8% decline at OsMoz. Showing a ninth drop in a row, OsMoz slipped below an Alexa rank of 200,000 for the first time. There was speculation in the comments to last week’s report that fragrance sites are in a seasonal lull and that readership will pick up with the start of the Spring perfume launches. Do these stats make my site look fat? Whatever Alexa is measuring, it looks like a down market in general. Don't take it personally. Though you are *still* on an upward trajectory, Mr. Gilbert, sir. What's your secret? We all want to know! Oh, wait, right -- interesting and regularly updated content. Hmph.